Sark as an island was the last feudal state in Europe, finally abolishing that system of government in 2008. This ended a curious political link, where the island was administratively linked to the island of Guernsey. The island itself was governed by a Seigneur who held the title in fiefdom from the Duke of Normandy, the part of France the island is closest to. However, the Duke of Normandy, thanks to the Battle of Hastings in 1066, is actually the current monarch of England! The island suffered an invasion during the Second World War, with the Germans taking the island, with 4 killed and 1 captured during Operation Basalt which saw a small British Commando raid for reconnaissance and prisoners. A second invasion also occurred in 1990, when a French nuclear scientist Andre Guardes launched his own personal invasion of the island armed with a machine gun. He stated that he would launch his attack by noon, and was arrested by the local policeman just before noon! The island was the last feudal state in Europe, and in order to fall into line with the European Charter on Human Rights, began dismantling its feudal system in 2007, with the first elected chamber sitting after the island first election towards the end of 2008. The islands flag was formally adopted in 1938 and was designed by Herbert Pitt. 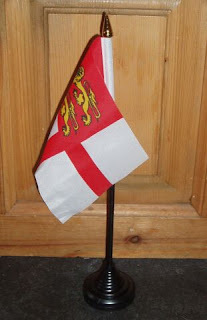 The flag itself consists of the Cross of St George, with the upper hoist canton bearing the arms of Normandy. However, uniquely, the banner bearing the 2 lions of Normandy actually stretches to the bottom of the horizontal red bar, and to the right edge of the vertical red bar.